This is a cast of the larger of two complete Clovis points that were found with the bones of one adult and one juvenile mammoth. 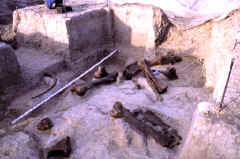 It was found during the excavation of the Lange-Ferguson mammoth kill site on the Pine Ridge Indian Reservation in South Dakota by L. Adrien Hannus, PhD. Dr. Hannus is the head of the Archaeological Laboratory, Center for Western Studies, Augustana College. 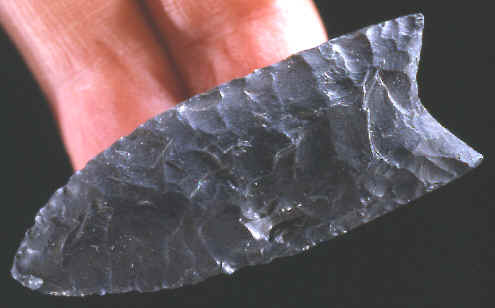 This small spear point was probably resharpened at least one or more times. It's made of a black opaque chert and measures 2 1/8 (54 mm) inches long. 1989, "Bone Modification" Peopling of the Americas Publications; "Flaked Mammoth Bone from the Lange/Ferguson Site White River Badlands Area, South Dakota, L. Adrien Hannus, pp 395-412. 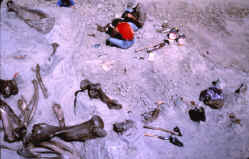 1990, "Megafauna & Man", The Mammoth Site of Hot Springs, South Dakota, Inc., Vol. 1; "The Lange-Ferguson Site: A Case for Mammoth Bone-Butchering Tools" L. Adrien Hannus, pp 86-99.